500 words from is an occasional series in which novelists talk about their new novels. Wayne Ng is about to publish his debut novel Finding the Way. Wayne was born in Canada to Chinese immigrants who fed him a steady diet of bitter melons and kung fu movies. He is an award-winning short story and travel writer who has twice backpacked through China. Prince Meng, the thoughtful but hesitant heir to the throne. Lao Tzu’s ideas of peace and natural order, however, leave him ill-prepared for palace intrigue and the toxic rivalry between Meng and his twin brother, the bold and decisive Prince Chao. Chao undermines Meng at every turn as he tries to usurp Meng’s birthright. Confucius arrives and allies with Chao, thus raising the stakes for control of the dynasty, culminating in a venomous clash between Taoism and Confucianism. With the king ailing and war imminent, Lao Tzu is betrayed; he must cast aside his idealism to fight for his life. As legend has it, the ageing philosopher Lao Tzu mounted his water buffalo and wandered off westwards to die. He was stopped by a guard who convinced the scholar to record his thoughts which formed the basis of the Tao Te Ching, the Book of the Way, the basic canon of Taoism. Or so goes the story of one of the most influential men to have ever roamed the planet. So little is known about Lao Tzu and his world of 2,500 years ago. I have always been drawn to dreamers and idealists, and I wanted to learn more of Lao Tzu than the few pieces of information available in the historical record. I wondered what his life was like, and how he developed the Way. These burning questions inspired me to fill in the blanks by writing a book which imaged his whole story. To my knowledge Finding the Way is the only fictionalised account of Lao Tzu’s life ever written, but my starting point was what we do know. The historical records are inexact, but it is said that he worked in the royal archives of the Zhou court and that Confucius kowtowed to him. It is conceivable that they met during the reign of King Jing (544-520 BCE), who supposedly had two sons, Prince Meng and Prince Chao, one of whom, according to the stories handed down, killed the other. In the first century BCE, the historian Sima Qian referred to Lao Tzu as being disillusioned towards the end of his life, and he told of how Lao Tzu mounted a water buffalo and set off to die, travelling at least as far as the Han Gu Pass, where he was stopped by a border guard named Yin Xi, who refused to let him pass until he recounted his life story. My novel picks up the legend from that moment. In my telling of it, young Lao Tzu is shaped by the never-ending wars around him. Yet he is gifted with a critical mind and vivid imagination that his father tried to shape in accordance with the natural rhythms within and around him. Roving barbarians massacre most of Lao Tzu’s family and he is forced to flee with his cousin to live with an uncle in another state. There, a new master recognises Lao Tzu’s potential, but before long he must flee once again, this time alone. Through his journey, his learned mind finds peace and solace through his Way (Taoism), and also through employment. Eventually he establishes his own academy and scholars flock to him. A betrayal then costs many lives and much of Lao Tzu’s work. It is then that he goes to teach the Way in the royal court of Zhou, where he encounters Prince Meng, and Prince Chao, and where too Taoism clashes with Confucianism. Many of Lao Tzu’s sayings are seamlessly integrated into the dialogue. 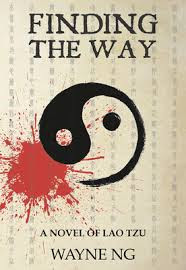 But I see the novel as much more than a platform for Taoism, although there’s no escaping the allure of the ease and balance that the philosophy offers. It is a richly-woven story of a tumultuous period in China’s history where people dared to dream, imagine and hope for a better world. For some such as Lao Tzu, crushing disappointments and pain were never far off. But it is a testament to his spirit and his beliefs that so many people wanting a reprieve from life’s chaos have found solace in the Way. Details: Finding the Way will be published by Earnshaw Books on April 1, in paperback and eBook, priced in local currencies.